Thailand is the Land of Smiles. A grin shows companionship. A laugh shows forgiveness. But what if you need a second-class train ticket from Bangkok to Chiang Mai? Keep smiling - this phrasebook will show you the way. When people talk about the Thai language they are really referring to a Central Thai dialect that has succeeded in becoming the standard official language for the whole country. For this reason Thai is only spoken as a first language in the central provinces of the nation. As Thai is the official language of education, government and media it's basically understood from North to South although recent estimates suggest that less than half the population of Thailand speak and understand Thai fluently. At Lonely Planet, we see our job as inspiring and enabling travellers to connect with the world for their own benefit and for the benefit of the world at large. * We offer travellers the world's richest travel advice, informed by the collective wisdom of over 350 Lonely Planet authors living in 37 countries and fluent in 70 languages. * When we update our guidebooks, we check every listing, in person, every time. * We challenge our growing community of travellers; leading debate and discussion about travel and the world. * We tell it like it is without fear or favor in service of the travellers; not clouded by any other motive. As with all phrasebooks, this one contains some phrases that are so dated that I can't even imagine a situation where one would use them. I also wished there was more on pronunciation. I ended up giving this to a friend who was staying in Thailand longer, but would use it again if I went back! I would recommend this if you want to take a stab at the language but don't want to lug around a huge book. This is an excellent phrase book, easy to carry, easy to read and broken into easy to find section. 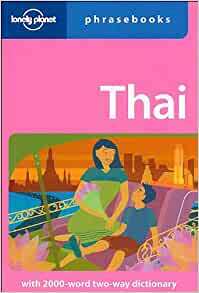 Combined with a short language program this book carried me across Thailand comfortably. I mentione the language program because the pronunciation is a bit tricky to break down phonetically, altho Lonely Planet does a great job of it. I have used lonely planet phrase books for all of Asia and Northern Africa, but I must admit I use Rick Steve's phrase books for European travel. Lonely Planet Guide Books are also very good, especially for the bargain traveler. This is a great little reference book if interested in learning Thai. Using some kind of on line or person audio assistance is necessary since Thai is tonal. Fits in the pocket and very easy to use! Read it on the plane to Bangkok and it was a lifesaver! I bought this book before spending 3 weeks in Thailand last year. I only cracked it a couple of times and had difficulty deciphering the phonetics. However, having just completed a Beginning Thai course offered by my county's adult ed department the book makes a lot more sense to me and I find the grammar notes and pronunciation easier to understand. I am headed back to Thailand next week and feel a lot more confident that I will be able to communicate if/when I come across non-English speakers. But for as good as this book is, I agree with the other reviewer that it helps to at least take a basic Thai course or listen to CDs like Pimsleur so you can hear the language. And as others have noted, top marks for including the Thai script along with the English phrases so you can just point if necessary. I am a huge fan of lonely planet guidebooks however I am not a big fan of phrasebooks in general. I have this phrasebook and can honestly say that i have never used it. The problem with phrasebooks is that no 2 are alike. Different phrasebooks give slightly different pronunciations (and with Thai slightly different tones) but again this all has to do with translation from one language into another which is not the best way to learn a new language( acquisition is proven to be the most effective but takes time!). However with this said, phrasebooks are practical for people who do not have time to study a particular language such as Thai which is very difficult for westerners and lonely planet is just as good as any other phrasebook that I have seen on the market to meet the needs of holiday travelers. This book has several great features. -It is small and easy to fit in a pocket, bag etc. -It has the words written out in thai. Without hearing and practicing pronunciation I find it very hard to get the tones and accent right. When people give me a blank look I can just point. VERY helpful. Especially considering that Thai words written in the roman alphabet make no sense to Thai people. If you're not looking to actually learn thai, but just want some help getting around and trying not to be the Ugly American, then I recommend this book.